Kristie Vaval speaks three languages, plays multiple instruments, is majoring in Music Performance with a specialization in recorder, and hopes to attend Juilliard for graduate work…but she’s hesitant to share those details. It’s not that she’s shy about who she is and what she’s come through, it’s that she cares more about serving others than shining in the spotlight…whether performing her music on stage or helping guests at Chick-fil-A. The humility and grace she shows when sharing about her gifts and accomplishments is a discipline she also applies when speaking of her journey to 144 Fulton Street, a caution only earned by difficult trials. Her restraint is understandable. The story isn’t easy to share. Growing up in Haiti, the oldest of four siblings, Kristie was blessed by parents who modeled hospitality and service by pastoring their local church, directing schools and orphanages, and always feeding those in need. It was their love and character that sustained and carried Kristie through one of the most devastating natural disasters of the 21st century. While the world watched via screens, the Vaval family experienced firsthand the catastrophic earthquake that ripped through Haiti in 2010. She was thirteen, hanging out in the church office on the second floor. Their mom was back at the house, their dad working in southern Haiti at an orphanage. With no railings on the staircase, she struggled to safely come down the steps as the wall of the church folded over and collapsed in front of her. She escaped to the lawn and into a surreal scene: their town covered in smoke, people running into the courtyard weeping, and children covered in dust and blood. Survivors gathered on the church property, stunned and broken, huddling together for a sense of comfort. Separated from her family, she listened for news of her two younger brothers, Jean-Mark and Moise Jr., who were both back at their school. Smoke and dust coated everything, and rumors spread through the crowd of possible tsunamis striking the coast where their church was located. Her sister, aunt, cousins, and some church folk decided to walk towards higher ground in the mountains. They endured through the night, feeling constant aftershocks, and not knowing whether their parents or brothers lived. The next day they walked from the church to her house, the people guiding them using shortcuts to avoid seeing the worst of the death in their community. They made it back to their home, mom was safe, and not too long after their arrival dad showed up healthy as well, but the two brothers were still missing. Because the aftershocks made their house unsafe, their family sat amidst the ashes, smoke, and chaos to wait for any news of the boys. Moise Jr. had no answer. He left a terrible nightmare behind him. The entire school had collapsed on him. Caught in the rubble by his belt, he unbuckled himself and escaped, but few did, and no one could account for the whereabouts of all the students. Kristie vividly remembers her dad standing on the rubble of the church, promising God that no matter what the outcome was, he would give glory to God. With resources scarce and infrastructure ruined, their city soon became unsafe so they fled to the countryside, searching in camps for signs of John Mark. Her mom even traveled to the Dominican Republic to look for him. The school eventually reached out to them about a body they found in a school uniform, and they needed her to come and help out with identification. It was their brother and son. The family rallied together to grieve Jean-Mark, but also held a celebration for him, that he was found and no longer lost. Kristie takes her time to find the right words to capture the horrors of the ordeal without making it sound sensational, but also to communicate clearly the courage and strength of her family. Chef Gordon Ramsay is famous for entering terrible restaurant situations and engaging the staff with no-nonsense wisdom and attitude, forcing them to deal with their issues, inspiring them to work hard to make things right. For Chantel Hernandez, the opposite is true: things are right in the restaurant, where she’s working hard to make the rest of her life right. As a child, she’d dreamed of being an actress or a chef, but when she started watching Ramsay on TV, she discovered a role that combined the best of both. And now she finds herself in an environment that values the qualities her chef hero espouses: good food, cleanliness, and doing things with excellence, the same values that are bringing her joy and direction as she seeks to build her career. Frustrated by the constant conflict, her parents sought to correct her attitude by placing her in a rehab house for teenagers on drugs…even though she didn’t do drugs. The strict but caring environment impacted her, and she came back calmer, returning to school. She joined the film club and was even elected student body president. As a junior in high school, Chantel entered into a serious relationship with a guy that looked younger but wasn’t, and they formed a toxic co-dependency. He turned obsessive and manipulative, and bad patterns re-emerged in her behavior as he sought to control her. She fought with her parents, choosing him over them, and they asked Chantel to leave their home. She left, and then quit attending school. The relationship lasted almost four years, causing a rift with her family that still impacts her today. She isn’t on speaking terms with them right now, but cherishes their role in her life, and wants to reconcile once she’s established herself on her own. The worst moments in the relationship came from contracting salmonella from a meal she didn’t cook. It developed into gastritis and she lost almost forty pounds in about two weeks, and to this day can’t have have anything spicy or intense to eat. Once again her curiosity led to on-line researching, and she improved her mental health through self-study and applying practices she learned. A recurring theme in her research was the idea of finding a relational support network, and she realized she didn’t have one. Looking for a better job, she received an email from WorkforceOne that she meant to swipe and delete, but it accidentally opened. It was an invitation to a group audition with Chick-fil-A Fulton Street. It didn’t take long for Chantel to find proof at 144 Fulton Street that the doubters were wrong. Chantel is working hard to pay down debt from dealing with the gastritis, and still fights bouts of bitterness and depression, but she’s landed into the middle of a relational support network that lifts her up. What else do you think others should know about Chick-fil-A? And as her hero Chef Ramsay already knows, doing things right starts with caring. The scar on his neck serves as a reminder of a past life that caused more than just nerve damage. Most people simply ask that you earn their trust, but Eddie Rodriguez requires you to bring your spy gear to defeat his defenses. The self-protection started early. His father was murdered in gang-related violence when he was six, and afterwards his grandmother tried to kidnap Eddie as her own. His mom, wrestling with five boys, fought to survive in a tough situation. He was angry and reacted by imitating the world he observed around him. Eddie never held any childhood dreams for a future job or family because he didn’t expect to live long enough to see twenty-one. As a kid, he was smart, strong in math, and learned sign language early when he lost hearing in his right ear at the age of three. The path of the wolf led him into patterns of destructive behavior and painful isolation. The scar on his neck was the result of someone stabbing him in a fight that escalated out of control. He almost died and was held in jail for attempted murder, but was released when the charges were dropped. His addiction to substances continued, and the walls keeping people out grew thicker, the fences higher. Trying to establish a normal life in society, he landed in a transitional home. One of the residents kept talking about God and pestered Eddie into a wager with him that if he lost he’d have to go to church. He did lose, but arrived drunk his first Sunday on purpose, but when he left, he felt something pulling him back to the church. Kicked out of the group home for drinking, he went homeless for eight months, sleeping on subways, often eating his only regular meal at the church. The darkness continued to gather around him, and his self-harm led to two failed attempts at suicide, a gun that refused to go off, and a last second trip and fall out of the path of an approaching subway train. He refers to those moments, and not dying from the stabbing, or surviving a car shooting, as true miracles in his life. At the Dream Center he was freed from alcohol, cocaine, and marijuana, and he’s now six years clean. They entrusted him with mentoring and leadership opportunities and he enjoyed the chance to share his testimony, to kindle hope in folks searching for signs of it anywhere. After returning to NYC, he worked odd jobs, mostly with hard work and little pay. He began volunteering in the church, helping set up services, and now he’s training others on how to serve and lead with excellence. They’ve also given him opportunities to speak, something he not only enjoys, but considers a calling, to share as often as possible his tale of hope after brokenness. One night he attended a class at the church and heard Luke Cook teach on leadership. Eddie chatted him up afterwards and earned an interview which led to his hiring into the the Fulton Street fellowship, a new place to learn how to tear down walls and let people in. Eddie admits that trusting people is still a process, and there’s residual pain from his past, but he’s taken big strides in the right direction. He’s reconciling with people, experiencing forgiveness, and throwing himself into the vision of Fulton Street: to pursue becoming better versions of ourselves. Elma Smith has always been a planner. She considers her options, figures out what she wants, and then makes a plan. While those two options haven’t become reality for her yet, her heart for planning has remained the same, even when life consistently messes with her blueprints. She’s worked for Chick-fil-A for twelve years, but she never intended to be in the restaurant business. After being laid off from the local YMCA for budget reasons, Elma went to the local mall to seek out a job at Bath and Body Works until she could get back on her feet. As she filled out the application in the food court while eating Chick-fil-A, a woman who worked there offered to refresh her beverage. They struck up a conversation when the woman revealed her mother was named Elma as well, and before lunch was over, Elma received an invitation to a Chick-fil-A Group Audition. Impressed by the woman's hospitality, Elma decided to attend. Forty people showed up, but she was the only one who left with a job. She soon became a certified trainer, and traveled around various Atlanta area Chick-fil-A restaurants serving in a variety of roles. Eventually her training experience landed her the opportunity to come to NYC and help open the world’s largest Chick-fil-A. She’d been born there, and her mom still lived in the city, so she jumped at the opportunity. When the wild and busy Grand Opening weeks ended, she returned south to the familiar patterns of home, not thinking she’d be back in NYC anytime soon. But once again, life sent her on another unexpected detour. Her mom was sick with colon cancer and needed her care immediately. She immediately thought of the Chick-fil-A on Fulton Street, and whether they’d be willing to hire her on short notice. Her text barely went out before an answer came back. Luke and the team would love to have her on the crew. Elma jumped right back into the fast-paced life of the restaurant, and was touched that many of the original Team Members she’d trained not only remembered her, but were excited that she’d returned. Her planning nature soon kicked in and she began picturing how she would fit in and what roles were best suited for her. Just as the new plans began to settle into place, another disruption arrived when she attended a meeting with Austin Haydel, the Chief Operating Officer. And while her childhood plans didn’t include this stop on the journey, it’s a welcome one that didn’t require too much editing to the original plans. “In five years, I will be an Operator and a mom of two boys. That’s it. Two boys. I’m done. It’s a wrap.” She laughs, but also makes it known that is definitely the plan. Her mom made it through multiple procedures and is doing much better now. Elma watches over her and comes in early everyday to 144 Fulton Street with her faithful wire notebook full of detailed schedules and action items. She’s thriving in a role she never planned for in a city she didn’t know she’d call home. She begins the late afternoon interview without an introduction. The tone is serious, but the spark in her eyes betrays her, as the smile breaks onto her face. She’s been at Fulton Street from the beginning, arriving every shift before the sun, baking tray after tray of hand-rolled biscuits, and anchoring the kitchen in cleanliness and attention to detail. Her laughter and her music often fill the back of house, and the attentive team member can catch her singing along as well. Miss Sophia gives out hugs, advice, and cautions with a spirit of care and compassion that she learned from her great grandmother in Jamaica. Her two daughters were already in the U.S., and it was the arrival of her grandson, King, that inspired the move to NYC to help with the family. Soon after, on the job at a local business, she received second and third degree burns in a horrible accident that wasn’t her fault. Forced to spend the night in a Manhattan burn unit for seven months, the situation grew worse as she was forced to move, and financial burdens ruined her credit. Applying those lessons, she works full-time and takes night classes to earn a GED, her eyes set on becoming an assistant nurse. Sophia’s heart is to serve and care for cancer patients, particularly children and seniors. In five years, she hopes to be married (or sooner! ), and desires to keep going in her education, because she loves learning new things, and wouldn’t mind owning a small business with one of her daughters. “New stuff makes the adventure nice,” she says. Sophia is responsible for much of that food in the kitchen, but is best known for her biscuits. She shares that the secret to great ones isn’t that hard and springs from lessons learned in her great grandmother’s home, lessons that apply to so much more than food. In a restaurant full of unique stories and people, there’s not a name more unique than God’schild Callabrass. There’s no special meaning behind it, just a brief legend of how it came to be. People often ask him it’s a real name, and he assures them that it is. The Team at Fulton Street may refer to him as God’schild, GC, or even Cal, and some form of his name is always being spoken as he transitions through many roles in the restaurant: from first-rate stocker to catering lead, from front counter hospitality to lemon squeezer in the cellar. His childhood was marked by transitions as well. His father passed away from a heart attack when GC was only two, so he spent time with both parents’ families, moving back and forth between the Bronx and Queens, switching schools every year. In that transient lifestyle, he rarely felt that he belonged, for he knew that every situation was temporary. But he did learn to observe people and how they interacted. He remembers distinctly at the age of eight riding in a car with his cousin and realizing for the first time what power and influence really meant. Watching the cousin give orders to others, including instructions to commit violence, created a desire in GC to hold power and sway over other people. Inspired by his grandmother who was a principal of an elementary school, GC wanted to be a teacher, but his relationship with the school system turned into one of conflict rather than development. As a young teen, he retaliated against a bully at school, and fought the security guard intervening to stop him. He was expelled by the NYC Board of Education as a “troubled teenager” and sent to an alternative school to be reacclimatized. His first week there, at the age of thirteen, he lost $800 playing dice with the older students. Soon after that he argued passionately with a stranger in the lunch line, the confrontation escalating until threats were made. The person turned out to be a young principal in the school, and GC once again was expelled. He shares the stories of his struggles as an adolescent with a sense of confession, knowing his current personality doesn’t resemble the belligerence of his youth. GC pursues that goal by reading books and watching videos to learn how to speak better, and constantly asking his leaders questions about their own development and what motivates them. Besides wanting to own and operate his own Chick-fil-A, GC is working hard on multiple dreams. He’s building his own high-end fashion brand as well as developing a motivational ministry that helps people overcome their inner skeptics. But his biggest drive right now, the one consuming his mind and influencing his decisions, is one that’s as unique as his name. He wants to be reunited with his wife. He met Veronica in seminary. Originally from Russia, she’d spent five years in the states and married God’schild in June of 2017. She recently went home to visit family but because of a clerical mistake concerning stamps in passports, and changes in embassies and immigration laws, she was informed she’d have to remain there for ten years. The separation is wearing on him, but the worst part is Veronica is eight months pregnant and he’s going to miss the birth of his first child. He’s working with a lawyer to reduce the ban down to three years, while also fighting his own battle with bureaucracy. His passport was recently denied due to his identity being stolen years ago. He feels a deep sense of pride in getting to work at 144 Fulton Street and declares there are only two options for him in his career, working for himself or Chick-fil-A. As God’schild embraces the possibilities of his own potential, pursuing the power that influences people for good, his gratitude is evident, and he glows with hope even though his situation could cause him to despair. Children who dine in at Chick-fil-A Fulton Street may not find a playground, but they may find someone even better. Hope Fonseca. She bounces through the dining room levels at 144 Fulton Street, sharing the famous phrase, “My Pleasure” so effortlessly, guests smile back knowing she means it. Sometimes she catches kids dancing, and that’s when she surprises them with an impromptu dance battle…which is way more fun than a slide. Hope lives in the Bronx with her aunt and uncle, her cousins, and a dog named Max that may or may not be spoiled from all her attention. The love of dancing sprung from childhood where she dreamed of being a dancer on Broadway, and spent much of her time in after school programs engaged in African and hip-hop dancing, as well as cheerleading, swimming, acting, choirs, and volleyball for good measure. With all those pursuits, and her energetic and positive demeanor, it’s shocking to discover she originally entered college to study forensics, specifically blood splatter, because of crime shows on TV. Those diverse interests also include personal training, where she landed a job assisting in a gym after posting “Aspiring Personal Trainer” on her Linkedin account. She loves the interactions with clients, and has no problem jumping into meaningful conversations. It’s in that confession that Hope pulls back the curtain of her smile and exposes the hard parts of her journey, including deep struggles with anxiety and depression. Her childhood was marked by conflict with her mom, who deals with bipolar disorder, a situation that caused her to live in all five NYC boroughs, spending time in the homes of relatives, and stints in the foster and shelter care systems. She was timid and shy as a child, and didn’t like going out, but her grandma had a close friend named Elsa who took her out to free and fun things in the community, or around the city, things like church events or Liberty Science Center. Hope credits Elsa for helping her come out of her shell. The volatile situation in her home escalated as she grew older, and she turned into a protective “mother” to her two younger brothers she adores. There were times when she was forced to react and intervene, and police were called. Although she’s been arrested, there was never any evidence so the arrests never led to convictions, just more disruptions to her life. Already engaged in personal training, her current dream is to be an in-house dietician in a gym she opens up with her brother in NYC. She’s passionate about turning her story into wholistic encouragement for others, and doesn’t shy away from the vulnerability of the details. Her strength shows itself everyday in the hospitality she shows the guests at 144 Fulton Street, a job that has surprised her since day one. Recently she met an older gentleman in line who was having a difficult time deciding what to order. She read him each item off the menu and together they “built a meal.” He made small talk about the beautiful weather and she guided him up to the rooftop terrace to enjoy the sunshine. Impressed with the menu and the hospitality, he vowed to return the next day. Jonathan Puello has no problem telling you he was a total class clown as a kid. Making his classmates laugh by acting out brought him more satisfaction than listening to teachers. He was so known for his antics that during a party when he was eleven, he almost drowned when everyone thought he was goofing off rather than genuinely struggling for air. A huge fan of superstar Tracy McGrady, Puello dreamed of playing basketball in the NBA, but wasn’t allowed to play on his high school team because of disciplinary issues, most stemming from his clowning nature. As he he grew older, his free spirit led to a series of “dumb decisions” as he sought money for nice things, particularly cars. The choices led to consequences, and he spent the last five years in prison, incarcerated for his involvement with drugs and burglary. He’s actively working on his leadership skills and style, trying to balance the fun with firm consistency. The class clown still lives deep in him, and he loves to cut up with the Team. He’s passionate about making sure the food goes out fast and correct, but wants to make sure there’s joy and spontaneity among the Team Members. Puello is quick to mention that the guidance of Austin Haydel, who he considers a mentor, has been huge in his development. “He’s given me opportunities, kept pushing me and continues to push me. He’s training me in so many ways, telling me what books to read, how to be a great leader.” He also mentions directors Thomas Haralson and Jeremiah King as two leaders that work side by side with him as they train in all aspects of the business. Working through challenges to find solutions has been Puello’s heartbeat these past six months, and the class clown who used to chase things the wrong way is enjoying the benefits of these hard-won opportunities. Late in her elementary school years, Rakhel Perkins remembers passing notes with a friend as a boring substitute teacher taught the class. The friend wrote some profanity on the note and when the teacher came back and searched her desk, it was her who was reprimanded for the foul language. She remained quiet and endured the discipline, informing her parents about it later that night. The Team Members of 144 Fulton Street would have a hard time believing the radiant “Rocky” who joyfully holds down the line in the kitchen was once a shy girl unable to speak up in front of others. She grew up in the diversity and vibrance of Brooklyn, with a dental hygienist as a dad, and a mom actively involved in multiple projects in their community as she served on the city board. Rocky’s first job was a junior counselor for a new non-profit helping kids after school. They met in a basement and paid her fifty bucks a week. She helped them out five straight years, helping them grow into a highly successful organization. At sixteen, she worked for Macy’s for $7.25 an hour, and eventually quit school to work there, “valuing money more than education.” She lied to her mom that she was going to school, leaving every day at seven am and coming home after four. She struggled with a deep tiredness, and bouts of depression, but eventually knew she had to get back in the game. Applying for jobs through multiple platforms, she met Austin Haydel at a Fulton Street Group Audition for candidates interested working at Chick-fil-A. She’d been considering going to school for medical billing and nursing, after working hard to earn her GED, but the experience at that audition hooked her in. Through the interview process, Rocky met another director, Connor Chaffin, who had come to NYC with Luke, and she heard his story. When he hired her, he shared his excitement at being a part of her journey. She pictures where her future could be five years from now, and pauses before sharing, “I could totally have gone famous. I started wanting to be a journalist, then an english teacher, to an art teacher…or I could be a producer, songwriter, standup comedian, full-time poet, maybe a nurse…"
Rocky is also an anchor of Fulton Street’s growing local catering business, one of the first Team Members entrusted with representing the famous Chick-fil-A brand of hospitality and great food in the marketplaces of lower Manhattan. What do you want people to walk away with when they hear your story? At the age of fifteen, Austin Haydel lived in his car. He’d grown up in the public eye, in a tiny Louisiana church where his grandfather pastored, his grandma led worship, mom played piano, and dad directed the Sunday School. A constant tension bubbled under the surface of their family as they sought to maintain a certain public image while ignoring and hiding the problems in their home. When they found themselves finally under the same roof again, the pressure in their family exploded. The conflict ended with Austin, standing in his boxers and a ripped T-shirt, screaming at his parents, and them yelling back at him to leave. At first, he coasted between the homes of friends for a place to stay, switching locations when the parents started to suspect something. But after sneaking back to his house, he drove off in a new portable home, his 2004 Toyota Corolla, which went by the name Rolla because he’d removed the C and the O. He slept in the backseat, parked at Wal-Marts or public schools. After a year of hopping around homeless in his sedan, he accepted the invitation of a good friend, whose mom welcomed him in and made him feel like family. He filled his time with sports, multiple jobs, and leading worship at a local church. But behind his busy public persona, he led a secret life, selling whatever substances he could flip for profit. The kind of hypocrisy he’d hated as a kid had become his own pattern of survival. The breakthrough in his heart and with God didn’t make his life suddenly better or perfect. He soon after lost his car, and his job, and bounced around again from guest bed to guest bed. But through the benevolence of others, mainly rural churches, he found himself in a meaningful internship in Memphis, Tennessee. The internship led to other jobs and opportunities that shaped and matured him, just in time to move back to Hammond, Louisiana and get serious about his eventual wife, Taylor. He started working construction, and also landed a salaried position with a leading sports store chain. A fellow manager from the store invited Austin one morning to a free biscuit promotion at the local Chick-fil-A. The leaders at the restaurant tried to recruit him, as they raved about working under their operator, Luke Cook. After Luke pitched a vision of growth to him, Austin left his salaried job for $9.50 an hour to work at the Hammond restaurant…right before he married Taylor. It seemed like a step backwards, especially when he started in the kitchen six a.m. to four p.m., Monday through Saturday. Nine months later he quit. He threw himself into construction jobs and electrical work, seeking out ministry jobs for the cash. Overworked and frustrated, he wrote out a long text to Luke asking about the possibility of returning to Chick-fil-A…but he never got to send it. Luke called at that exact moment to ask if he’d consider coming back. They discussed a plan for his future, and two years later he stepped into the role of Executive People Director. Austin and Luke’s relationship blossomed into something rare, both a fruitful business partnership and a meaningful friendship. “Any business owner on the face of the planet would love to have a guy like Austin at their side leading an organization. I’m better because of what he has invested in our business and the friend he has been to me,” says Luke. A few years later, the duo embarked on a path of trust and risk together, leaving their successful restaurant in Louisiana to tackle the largest Chick-fil-A ever, down in the heart of Manhattan. But the two men don’t just discuss business moves together, they share the big personal decisions, too. When asked what accomplishment at this stage of life that he’s most proud of, Austin talks about adopting his oldest son, Colston. In June 2016, their son Shephard was born and Colston ran in and claimed him as his own, and called Taylor mom for the first time. That moment changed them and brought them together tight as a family. In December of 2017, Colston’s adoption was finally official. That’s always been Austin’s dream. To bring change. To fix things. Before they clock in, many Team Members at 144 Fulton Street begin their shift by visiting the cold prep area where the salads and wraps are made. The restaurant is five levels, and down on the bottom, on the floor called The Cellar, GiGi Rodriguez waits to greet them with a smile as she washes the day’s produce. Some even walk back among the fruit cups and boxes of lemons to receive a warm hug. While the smile she shares is genuine, it’s also hard-earned; for beneath the joy is a strength forged by trials. Her parents met in NYC after arriving separately from Puerto Rico, and raised their family in the heart of the Bronx. Her mom placed a heavy emphasis on work, because it was “the key to getting what you wanted,” so a young GiGi started her first job in the housing projects, cleaning and taking out garbage, or painting playgrounds and fences. GiGi's escape journeyed through Massachusetts, New Jersey, and down to her beloved Puerto Rico. By her perseverance, those three young boys became three young men, and a sister, and she raised them to adulthood in NYC. "I call them my 'Amazing Four.' I taught them to respect women and people, that even when you’re angry, you treat people right. And my sons treat their wives like queens." Even though her sons and daughter have blessed marriages, "they still need to call mom to talk." She has one grandchild already, and another on the way, and also found a healthy relationship herself the past two years, a relationship full of respect, trust, and love. That’s also why GiGi loves loves serving at Chick-fil-A, because it provides her “the opportunity to lift others up.” Her energy flows from encouraging the current generation to persevere. What does she think people should know about Chick-fil-A? “It’s so good! They need to come! It’s all fresh, come experience it! Especially Cow Appreciation Day!” And what does she want people to walk away with when they hear the story of GiGi? "I don't want pity. I want them to know I'm a survivor." She's more than a survivor, she's a hero who represents the best of Chick-fil-A, and the heart of the 144. In Nigerian culture, the firstborn grandchild is called the “ada,” a name that carries both honor and increased expectations. The summer of her third grade year, Nkechi Nwagbara learned firsthand what it meant to be the ada of her family. When the school year ended, she had friends and fun on her mind. But a visit from her Nigerian grandma instructed her on the priorities of the ada: work now, play later. She reminded Nkechi that she set the example for the family. So instead of running around playgrounds and laughing around pools, Nkechi dove into books and summer projects for the upcoming school year. Most third graders would wallow in self-pity at the unfairness of the universe. But not Nkechi: she embraced the lessons of her grandma, the mantel of the ada, and the desires of a young kid. The next summer she worked hard and finished her entire summer reading list early so she could enjoy the break with her friends. "I learned that you need to know when to have fun and when to be responsible and do what you’re supposed to," she says. Although she takes the firstborn grandchild responsibilities of her Nigerian heritage seriously, she's also half Jamaican, and says with a smile that she's "more infused" with her Jamaican side. She describes her family as loving and open, and her childhood always had a sharp focus on education. Her pivotal years were spent in Texas, where her strong desire to do her best was cultivated. "It used to be just me, and I would go outside and lie in the grass and look at the stars. I want my kids to have that experience." She wants to provide that life for them, "that they won't feel like they're missing out." When asked what career she dreamed about so that her kids could grow up under a sky of stars, she doesn't hesitate with her answer. "A doctor. A lot of African people encourage their children to be doctors and lawyers. My Jamaican side was more 'follow your heart' but my hairdresser passions got shut down," she laughs. She moved with her mother from Texas to NYC in 2001, experiencing the upheaval and ”shift in energy” in the city due to the attacks on 9/11. Her mom became her hero, instilling in Nkechi an independence that she's proud of. "Despite the little we had, she made it work. We weren't 100% comfortable, but we were happy." Rooted in the diversity of her Brooklyn neighborhood, she developed a desire to help people and invest in specific communities. That passion, coupled with her interest in science and her childhood experiences, led her on a path away from medical doctors and court room lawyers, and into the realm of Speech Pathology. "I stuttered very badly as a child, and I still remember a speech pathologist who built my confidence as a kid. I was able to see communication in a new light, and I want to help kids like I was helped." With that goal in mind, Nkechi applied the lessons of her younger years and proudly graduated this June with an Associates in Liberal Arts. The accomplishment brings her great joy because she had to persevere through a dark time of debt, including a time of confusion about her direction and education. She eventually transferred to a community college, finishing in two years...and made both the Dean's List and Honor Society. She's currently researching schools in the southeast in order to earn a degree in Communication & Science Disorders so that she can work in deaf communities, hoping to travel around and invest wherever she finds folks in need. As she plans for that next season, she also serves at the front counter at Chick-fil-A Fulton Street, where she's constantly learning lessons she knows will help her start her own practice in the future. "It's opened my eyes to the business side of things, and humbled me...with the screens red, and guests being frustrated or urgent, just learning how to show enthusiasm and love when that happens." At her old job she hated cleaning up. But at 144 Fulton Street, there's a whole new viewpoint on why it’s important. She wants to "do it right and 'get in the corners' knowing I’ll need to do it one day on my own in my own home and business." She really appreciates the way Team Members are encouraged to pursue their dreams. The leaders are "very supportive of our TMs, even if we don’t stay, you open the window for us, creating an environment where we’re encouraged to be what we want to be." What do you think others should know about Chick-fil-A? "We are a very loving culture. I love how we communicate with our guests and the way we go above and beyond. I love that our directors are hands-on, sweeping, wiping down tables, bagging, and I love working with directors rather than for directors... it makes it a family atmosphere, where we value relationships with guests in and out of restaurant." And what do you want people to walk away with when they hear the story of Nkechi? "Do not give up, and to have hope. No matter how dark things get, keep going." Living in a "less than ideal" situation in Atlanta at the age of sixteen, Dominique Carter started a job at a local Chick-fil-A. His shift manager often offered him truck rides to and from work, and the two developed a friendship on those trips, discussing life and engaging in conversations about professionalism and excellence. One day the manager took him aside to share how to compartmentalize what he was experiencing outside the restaurant, in order to be present in the moment. Dominique remembers it as a turning point in his perspective, where he began to establish a "pillar of expectations" in his life, both for what he demands of a restaurant shift and what he expects of himself. Raised by his adoptive mom, who nurtured 53 children via foster care and adoption, Dominique grew up in the Brownsville community of Brooklyn, shaped by its unique challenges and melting-pot-diversity. As a child, he wanted to grow up to be a lawyer with a red sports car and a fast motorcycle, but he most desired to help people. One of his earliest childhood memories, during a time when a little money was needed to go a long way, Dominique spent his Christmas cash on a bag of clementine oranges that he handed out to workers at his local grocery store. "I really value philanthropy. To give back is intrinsically to be human," he says. His dedication to helping others grew during his time in Atlanta. Besides working for Chick-fil-A, he served as an advocate for youth in foster care, and at the age of 16, was invited to the governor's mansion because of his active support for extending healthcare for foster children until they reached the age of 21. "I was an advocate before I could even tie a tie," he laughs. He went on to be the first of his mom's extensive family to earn his degree, in International Business, even though he never expected to go to college. And after his journey wandered through Philly and Atlanta, he arrived again to New York. But his old boss and mentor refused to give him a reference. 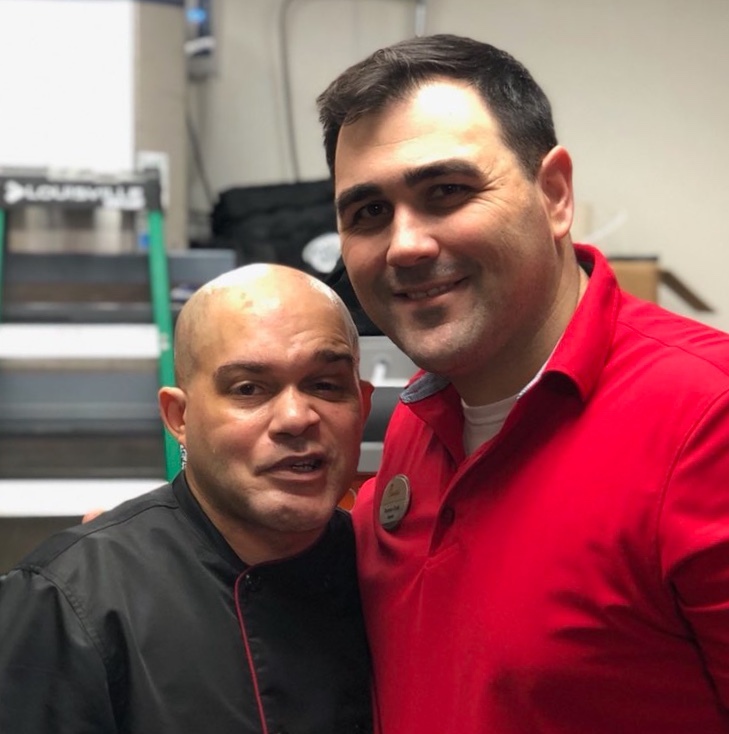 "If you're going to work at a NYC Chick-fil-A, you're going to work for me," said the manager with a smile, who happened to be Luke Cook, the operator of the Chick-fil-A at 144 Fulton St. Their Chick-fil-A journeys started together in Atlanta and now joyously reunited in Dominique's hometown. They both appreciate how far they've come from the fledgling shift manager and the wide-eyed teenager who chatted about expectations in truck rides home from work. "It's no coincidence that we all arrived back here in NYC together: me, Luke, and Chick-fil-A." Eleven years later, and thirteen hours away from Atlanta, as we sit on the rooftop terrace of our restaurant, we laugh that he never landed that red sports car, but he does wear a sporty red shirt everyday. And as he works again at a Chick-fil-A, he's still applying those same lessons of expectations and attention to detail he learned from Luke back in Georgia. When asked about his current expectations, he smiles and ponders the question with his trademark thoughtfulness. "It's such a cliche, but I do want to improve every day...in all aspects, overall well-being: physical, mental, financial responsibility." He's specifically been working on reading more, especially leadership books, and his ultimate dreams include creating a global plan to help at-risk youth and communities. But he is cautious of "feel good projects," keeping an experienced eye on "creating sustainable systems that help people" in the long term. He does point out that his transition into adulthood has reinforced what it takes to maintain his passion for serving others. "I've been alive for 27 years, but I finally feel like I’ve just started living." He pauses again. "You can’t thrive when you’re in survival mode. You can’t help others when you’re just trying to float. I see how easy it is to become complacent." He knows that with no parents or teachers around, the absence of outside authority figures makes it easy to coast. "How bad do you want it? If excellence is the expectation, you gotta work at that, it requires effort." To maintain all his commitments, Dominique stays deeply rooted in his faith, and enjoys fashion and writing poetry, with a goal to have a spoken word finished by the end of the year. What does he think others should know about Chick-fil-A? "Refills are free, even in NY," he laughs. "It's one of the few places that really walk the talk. From an employment perspective, you really get what they promise. And they really do want to put the guest first. People should know, Chick-fil-A isn’t so insulated that it can’t see other people’s viewpoints and perspectives, other people’s lifestyles, it’s a misconception that we only have one kind of employee or one kind of guest."